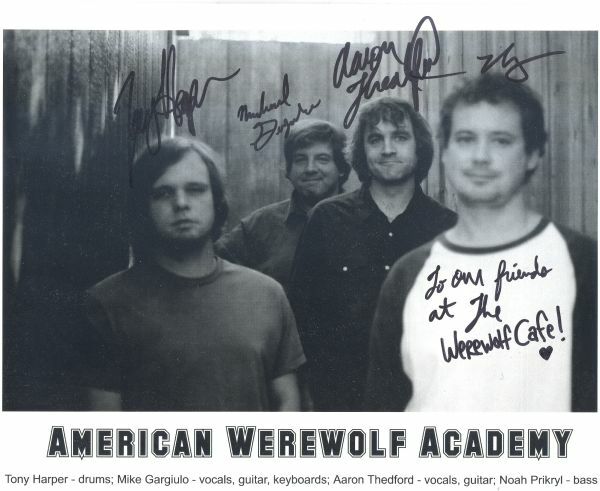 A big thank you goes out to the band "American Werewolf Academy" for this cool autographed band photo and band stickers. This four member musical group is from Dallas, Texas and consists of band members Aaron Thedford (vocals/guitar), Mike Gargiulo (vocals/guitar/keyboards), Noah Prikryl (bass) and Tony Harper (drums). 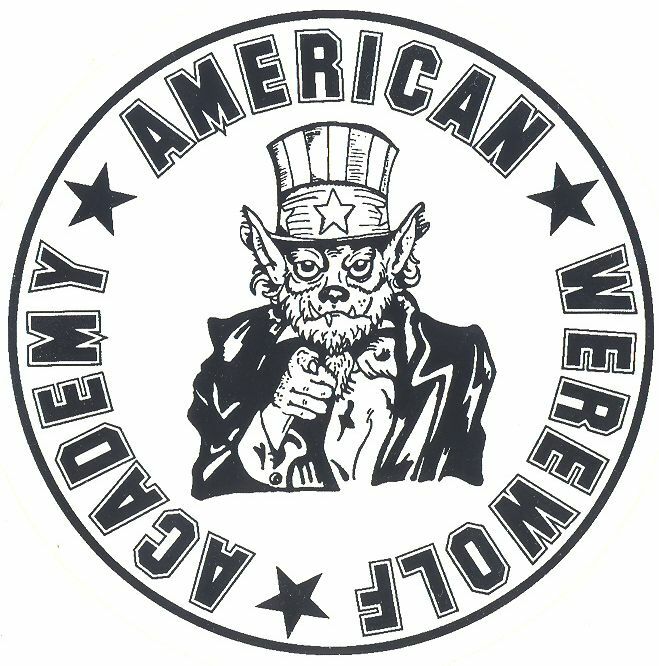 They have a very informative website at www.americanwerewolfacademy.com where you can find information about their CDs, band bio, pictures, MP3s and more. 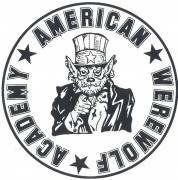 Thank you so much American Werewolf Academy! A huge thanks are in order for our good friend BIglehart and the following list of music. It doesn't have links like the movie list yet, but we promise it will only get better. 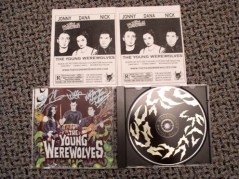 A big "thank you" goes out to Shewolf Dana K, Wolfman Nick Falcon and Jonny Wolf who are the band members of "The Young Werewolves." 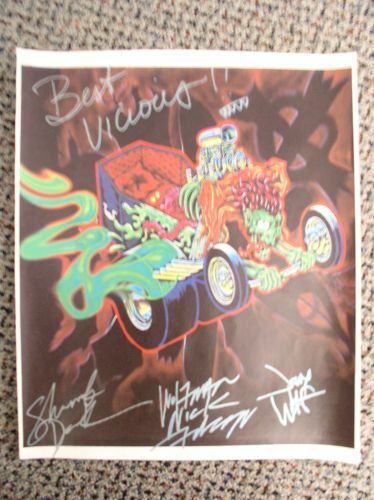 Check out the images here of their autographed CD, autographed photo, autographed poster (the poster art is a bigger version of some of the art that can be found on their CD cover insert), stickers and promotional flyer. Thank you! To find out more information about The Young Werewolves band, you can visit their website at www.theyoungwerewolves.com for more information. 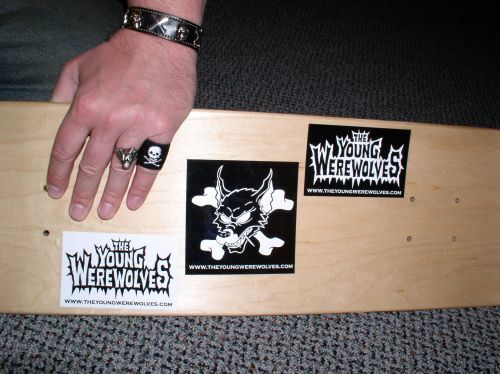 The Young Werewolves also have a forum here on this site. Finally, a second entry on our music page...Check out track number 9 on Metallica's Black Album, titled "Of Wolf and Man". 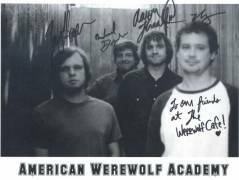 Thanks to Dave Leyva for submitting our first Werewolf related music entry. He points out that The Cat Power album "You Are Free" has a song entitled "Werewolf".